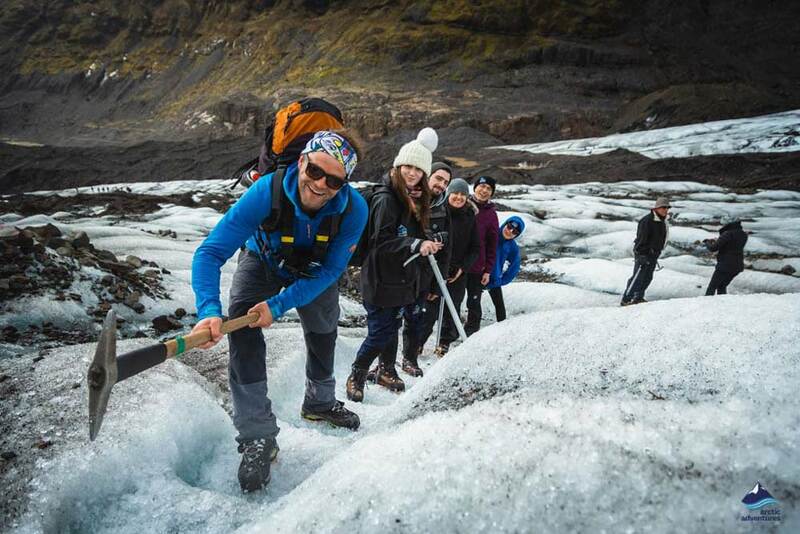 Visit Seljalandsfoss and Skógafoss waterfalls, views of iconic volcanoes, the black sand beach at Reynisfjara the stunning Reynisdrangar peaks and an easy hike on a glistening glacier. 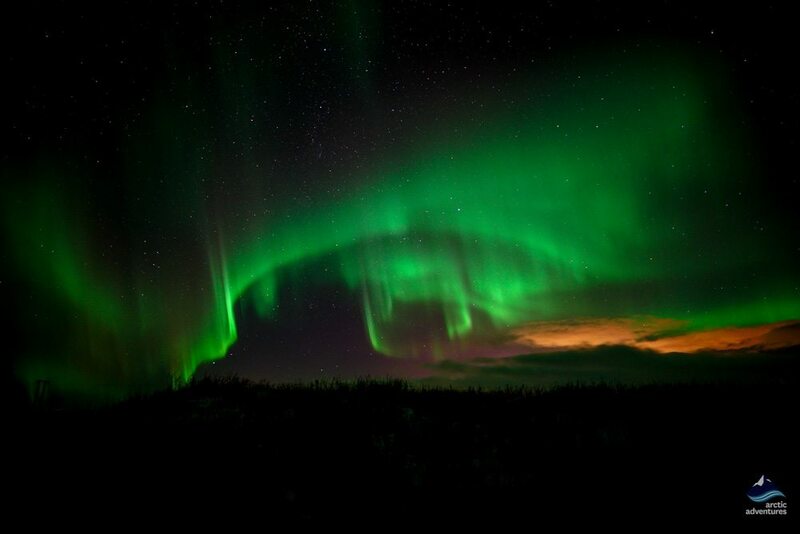 When darkness falls you will see the glorious northern lights if conditions allow. You get time in Reykjavík to have supper before the northern lights tour. Your guide will also take free photographs so you can keep the memory! 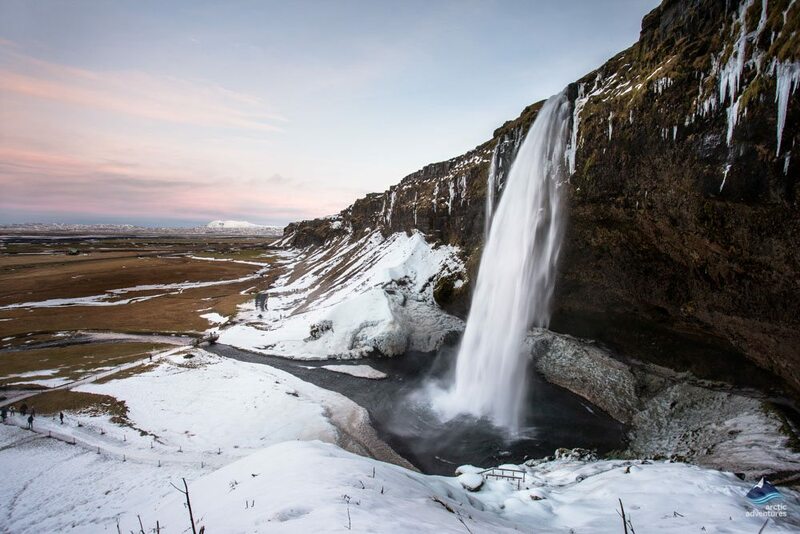 You are driven through the scenic countryside to Seljalandsfoss waterfall. A pathway leads behind the falls, from this angle you can feel the full force of the cascade and get a unique photo opportunity – rainwear is recommended! 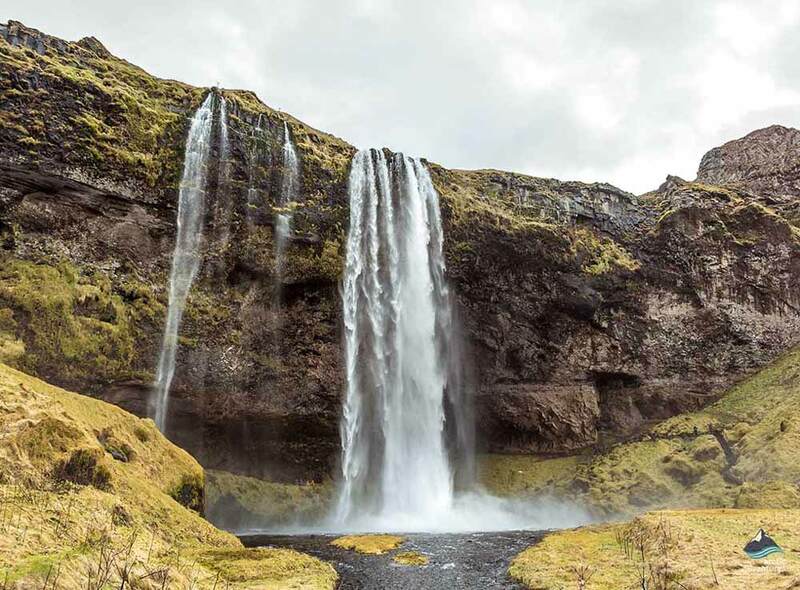 There is a short hike between Seljalandsfoss and Gljúfrabúi, “The hidden waterfall”, where you can go and feast your eyes on this hidden gem. This spectacular waterfall is hidden inside a small gorge and is definitely worth a visit. 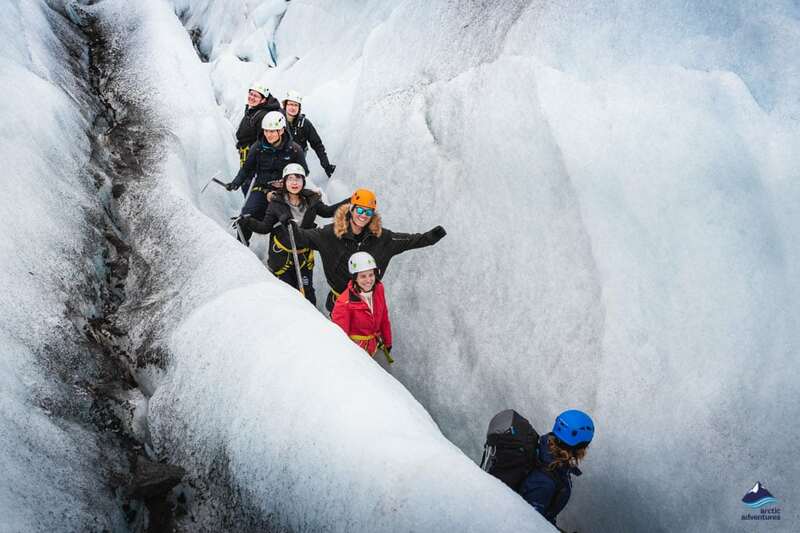 Traveling onwards through stunning scenery you will arrive at Sólheimajökull glacier for a once-in-a-lifetime glacier walk. 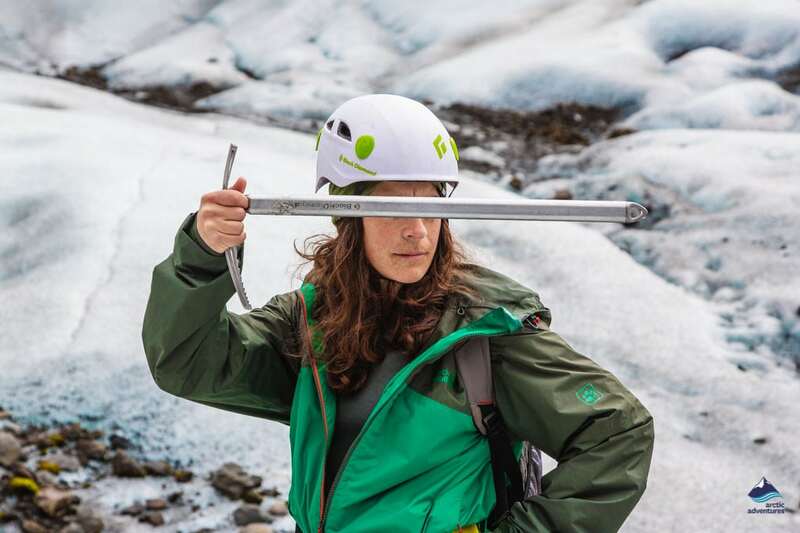 Your certified glacier guide will issue you with crampons and other glacier equipment. 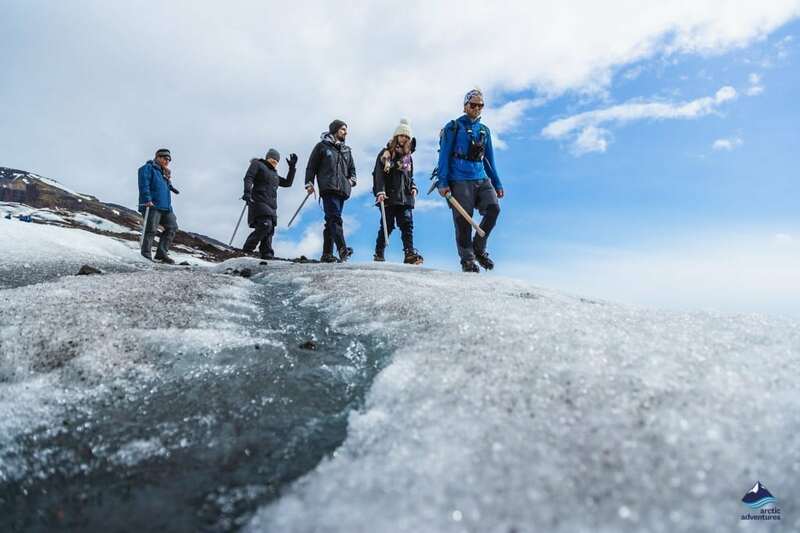 You will even hear the ancient ice cracking when it moves, as you explore you will learn about the glacier, its movement, crevasses, and formation. 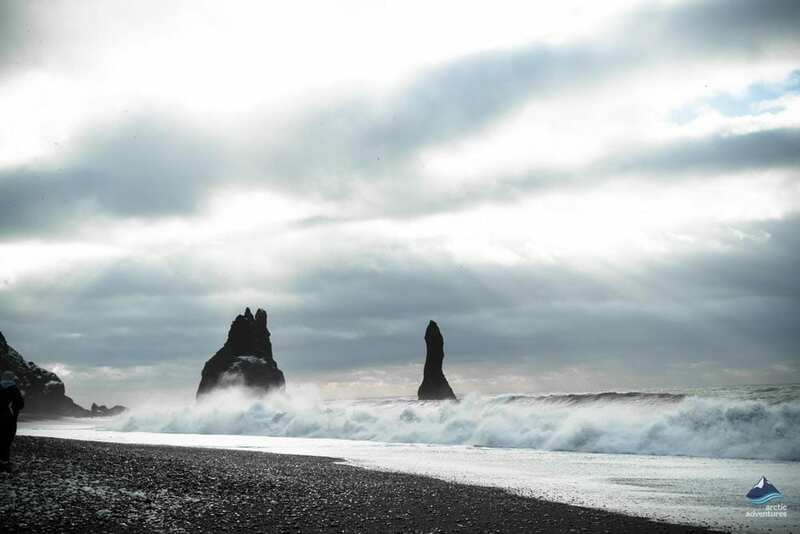 Next up is the black sand beach at Reynisfjara to see the dramatic basalt columns and cave, the Reynisdrangar cliffs and the basalt rock stacks that rise above the Atlantic waves. An Icelandic legend says these were trolls which were turned into rock when they faced the rising sun. 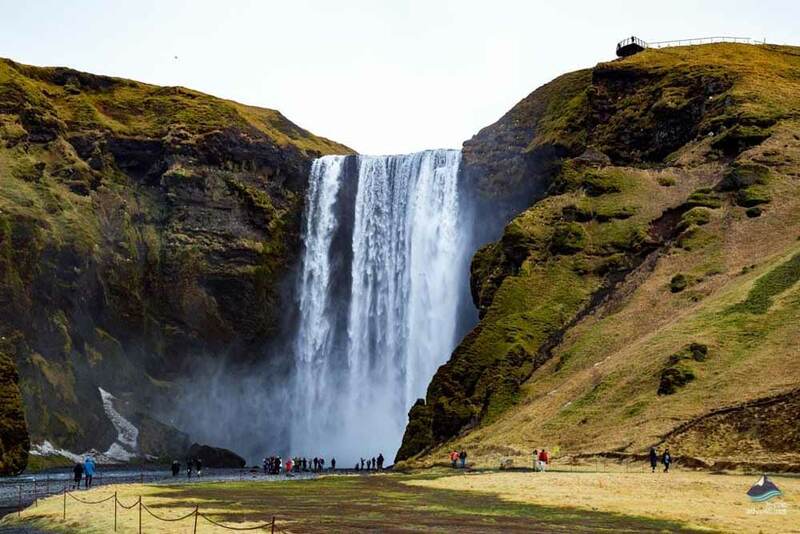 Finally, you will come to the majestic Skógafoss waterfall, a pathway with 527 steps leads up the side of the waterfall, giving a grandstand view of the falls and the rainbows which appear on sunny days. This waterfall is also the location of a famous Icelandic legend. It is said that Þrasi Þórólfsson, the first Viking settler in the area, buried a treasure chest in a cave behind Skógafoss. 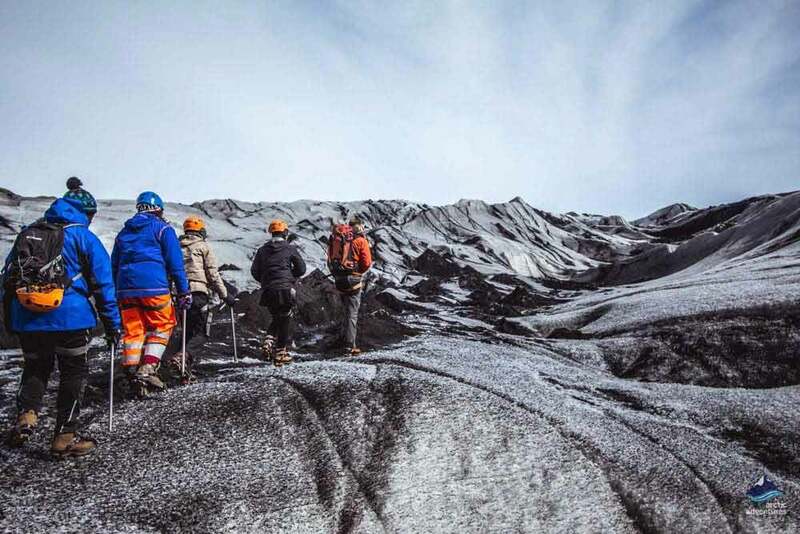 This is volcano country, on a clear day, you will get views of Eyjafjallajökull, Hekla and even the volcanoes around the Westman Islands, just off the coast. This trip has an intimate and friendly atmosphere. Our guides always welcome your questions! You are dropped off at your hotel in Reykjavík at around 19:00 pm, really close to the restaurants so you can get something to eat. 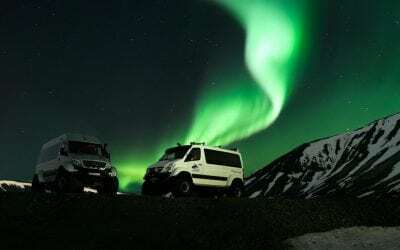 We pick you up for your northern lights minibus tour at your hotel at 20:30 pm. 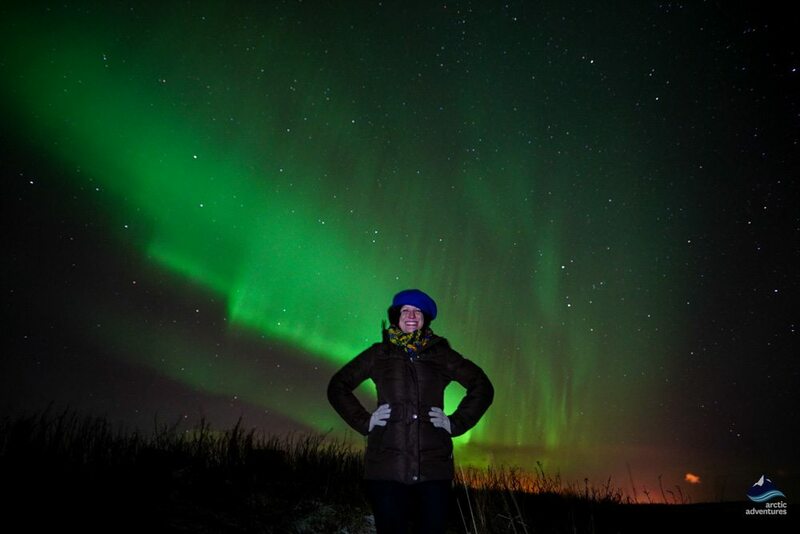 You will be taken to the best places in the countryside to see the aurora. The moment when you spot the first whisper of their glimmering colors is always spellbinding. Green, yellow, white and sometimes blue or purple northern lights are usually seen. Red auroras, from deep red to rose and vivid violet are more common in Iceland than elsewhere in the world, but still quite rare. We can never promise you will see the lights but we do our very best. 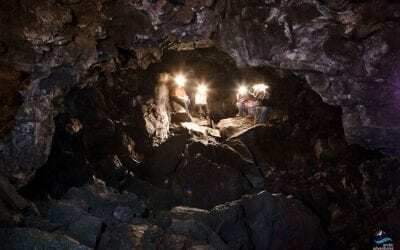 The tour returns to Reykjavík around midnight / 01:00 – as always the weather can influence schedules. You are dropped off where we picked you up in the morning. 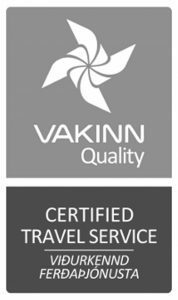 Pick up is at 08:00 am from your hotel or a nearby meeting point in Reykjavík. Picking everyone up can take up to 30 minutes, your patience is much appreciated. What to bring: Warm layers, waterproof jacket and pants, headwear, gloves, scarves, water bottle, snacks and a small backpack is always useful. 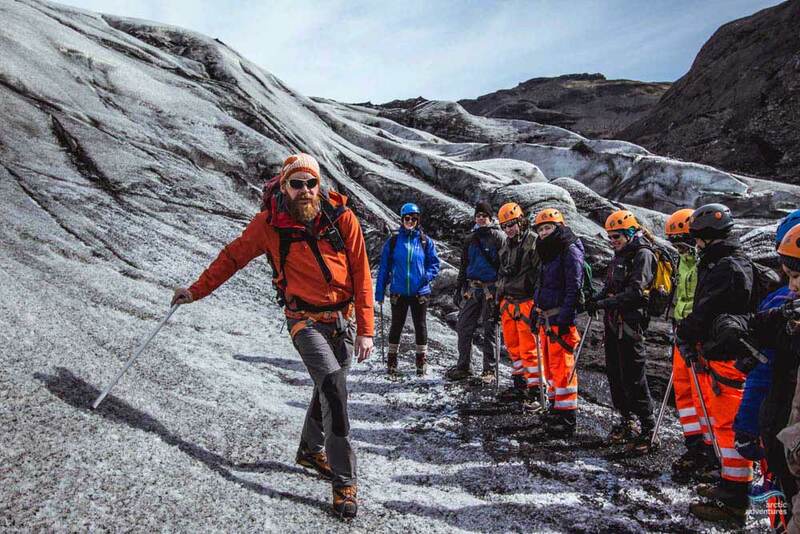 Strong hiking boots are absolutely essential, ice crampons are provided for your glacier walk, it is not possible to fit them to any other kind of footwear. 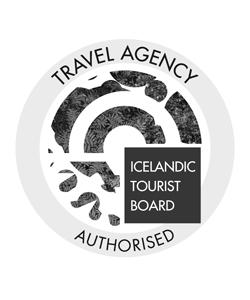 This is a combination tour which blends together two immensely popular tours, Magical Auroras Northern Lights and Glacier Hiking, Volcanoes and Waterfalls tours. You have time to get supper from a café/restaurant in Reykjavík, meals and beverages are not included on this tour. 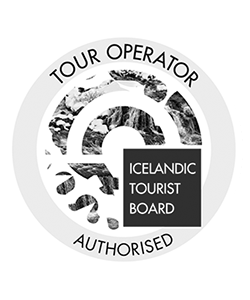 As the success of the northern lights tour is heavily dependent on weather conditions, we reserve the right to cancel this part of the tour until 18:15 on the day of departure. 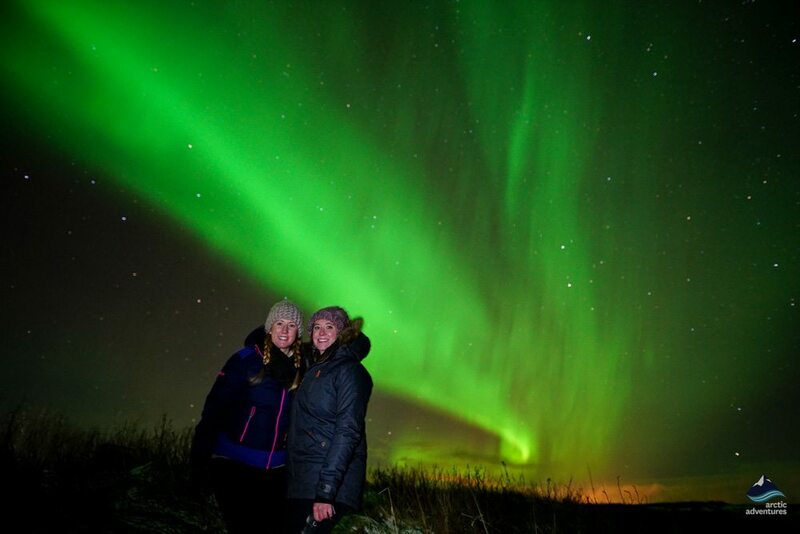 If the tour goes ahead and no northern lights are seen we offer you the chance to join another evening´s departure free of charge upon availability. 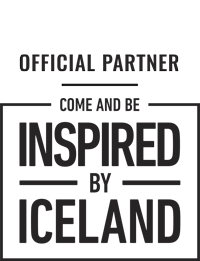 Note that you need to contact us to re-book. We have just returned from Iceland and by far the best trip we did was the combo day excursion followed by the northern lights. 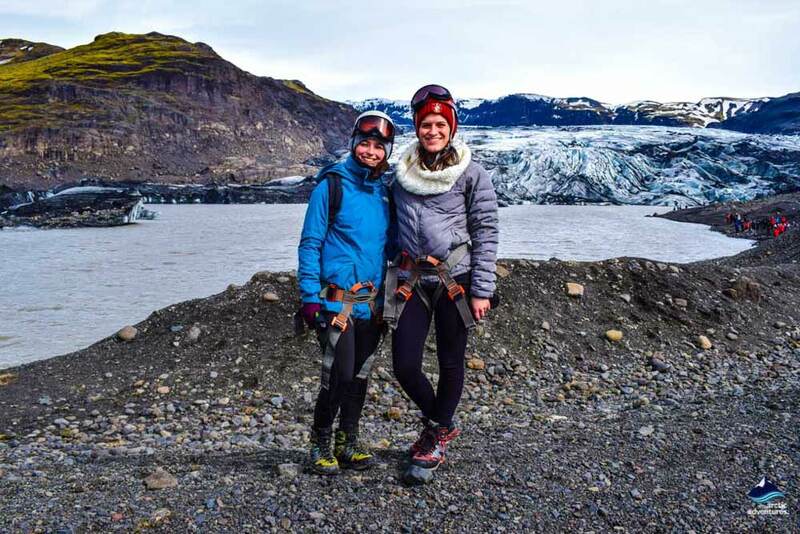 The hike on the glacier was amazing the staff were friendly, great knowledge and made the day really enjoyable. Our glacier guide Pepe deserves a special thank you as does our driver for the lights tour Klembie. He was wonderful, humerous and entertaining and really explained the lights, how to take the best pictures and was so excited with us when we saw them. Cant recommend enough the trip or the company – excellent!